Does it start with an Idea? Does it start with a featured leaf? Yes. Either you have an idea on what the taste you want to be or you have a leaf that you want to showcase. At this point you roll your first test cigars using the knowledge of tobacco that have gotten you to the point of being able to blend cigars. Even with this knowledge, without fail, your first attempts at a blend will not be exactly what you want. If your cigar is too strong you must add a bit of lighter tobacco (or take out the stronger, or both). If it has not enough spice you need to add a bit of tobacco that has spice to it. Depending on what kind of changes you want to make in the flavor profile you can change different factors. For example, taming down the power of a cigar is a common issue. You can make a cigar milder in many ways: You can get tobacco from a different country. You can get tobacco that is shade grown. You can get tobacco that has more age on it. You can get tobacco that is a lower priming (maybe the seco or viso). You can also have any combination of the just recently listed options. There are so many options out there its mind boggling. The best way to learn how to blend is to become very familiar with all aspects of tobacco and how it is made into a cigar. With this thread I will try and bring to light some of the basics of what needs to be known to blend a cigar. Keep in mind that I am by no means an expert blender. In fact, I am a novice cigar smoker with too much passion and too much time on my hands. Some of this info you have seen before. Some may be new. Of course, how much and what kind of tobacco you use will impact the flavor. It is widely understood that a good percentage of the flavor comes from the wrapper leaf. Depending on the strength of the wrapper leaf it can be about 40%-60% of the flavor. (If not more) That means that 60%-40% of the flavor still comes from the filler. Within the filler itself, having the right amount of different leaves is critical. Most of the strength of a cigar comes from the filler. Much of the complexity is in the filler. The filler is the chance to take the focal flavor in the wrapper and give it some life. Some of the first decisions in making a blend will probably have to do with what country or region the tobacco will come from based on your tastes and what you are looking to get out of the cigar. Lets start with the biggie: Cuban tobacco. Cuban tobacco is usually described as spicy and more full bodied. It is highly aromatic, and usually complex. In my opinion there is nothing amazing about the tobacco itself, its just a very good version of tobacco. the leaves are heavy and supple. there a flavor that many describe as a "twang" but i feel that "sharp" does a better job of describing the flavor. The "forbidden fruit" makes it more tempting. it is a bit over rated. But dont get me wrong, if Cubans werent so hard to get id smoke way more often than i do now. this country produces a lot of tobacco and it seems that many of the strains from the DR originated in Cuba. This combo tends to yield some very complex cigars. I find Dominican tobacco to be not as spicy or as full bodied as Cuban. Historically, the D.R. produced relatively mild Filler tobaccos, but the last decade has seen this country develop fuller and heavier bodied tobaccos as well as Wrapper leaf. some of the best cigars I have had were Dominican puros. Ecuador: this region's tobacco is usually a bit on the mild side compared to the same strain grown in other areas. this is mainly due to the consistent cloud cover in this region. the clouds act like the shade when fields are actively shaded for shade grown tobacco. the size of the veins is smaller and the leaf itself is thinner. Personally I find cigars with primarily Ecuadorian tobacco a bit on the "simple" side. Not to say it isnt good, because it is (the 5 Vegas Limitada uses it as a wrapper) its just a touch mild. i also find that there is a woody and maybe salty taste to it as well. Honduras: this is one of my favorite areas to have tobacco from. The tobacco is full bodied and round in flavor. Spice is hit or miss. The aroma is usually strong. this tends to stray to the nuttier side of tobacco. Nicaragua: This tobacco is very close to Honduran tobacco. I find it less "round" than Honduran but dont get me wrong, its still some of the best tobacco in the world. it is rich and spicy and highly aromatic. Nicaraguan tobacco has a woody pulpy texture to the smoke itself. it is very distinct. some of the most complex tobaccos in the world come from Nicaragua. Connecticut: one of the widest used wrappers in the industry. Usually on the mild side. Connecticut shade is more elastic and Connecticut broadleaf is heavier and has more veins. Connecticut broad leaf is of Cuban descent. it was brought here after a strain of sumata tobacco was tried and failed to yield decent results. the combination shade and less fertile soil than Cuba gave this Tobacco its own unique and light taste. the veins are small and the leaves are supple. all of that in conjunction with consistent color on the leaves make it a great choice for wrapper leaf. the other US tobacco is Broadleaf. it is grown directly in the sun making it stronger in structure and in flavor. it usually requires extra fermentation to make it palatable. Indonesia: Most Sumatran tobacco comes from Indonesia. The tobacco is "neutral" in nature. this tobacco is consistently dark in color, rich in flavor, not particularly complex, and produces excellent wrapper leaves. this tobacco often has desiccant qualities to it. the mouth dries as you smoke. this is more popular in Europe. Cameroon: this region also produces very "neutral" tobacco. It is originally a Sumatran seed that was imported to the area. tobacco grown in this area is usually grown under direct sunlight and since the soil is rich, fertilization is not often used. it often makes a good wrapper leaf because of its appearance, supple texture, and resilient strength. the flavor is often considered sweet compared to other tobaccos. Brazil: Brazil produces stereotypically good binder and filler. The tobaccos are rich and naturally rich and dark. Brazilian tobacco is also a good candidate for wrapper leaf and has been used on cigars such as La Aurora Preferido Maduros, Carlos Toraño Signatures and Alec Bradley's Trilogy Maduros. The Wrappers are usually rough in appearance and is almost always sun-grown. The Flavor tends to be Earthy and Sweet, unlike typical Maduros From Connecticut Broadleaf that tend to be more chocolatey. The differences in country are due to climate, elevation, weather and soil conditions. Each of those factors effect the tobacco differently. It is entirely possible to have tobacco come from two different parts of the same country and taste different. However, for the purpose of this thread, I wont be getting that detailed. The tobacco itself has almost all come down from a Cuban tradition. The Criollo strain can be documented all the way back to Columbuss visits to the Caribbean. It is the classic Cuban tobacco. It is rich and round in flavor with a spice to it. The Corojo tobacco plant is a derivation of the Criollo. It was created in Cuba through natural selection to resist mold. The taste is a bit more barnyard (in a good way) and it still has a spice to it. Connecticut broadleaf is a common wrapper and binder leaf. It is usually a bit on the mild side and has a tendency to be vegetal in flavor. There is little to no spice. It is possible to plant a Connecticut seed in Honduras. This will taste like a standard Connecticut leaf but will take on some of the characteristic of the Honduran growing region. This specific example could give you a mild but round flavor. Most tobacco reacts the same way to the aging process. Age smooths out the taste and mellows the tobacco as well. The longer it ages the mellower and smoother it will be. Once the tobacco is picked it is set aside to ferment and/or age. Not only does this change the color but it changes the flavor profile. A maduro process is different than just aging. Maduro also cooks the tobacco. The bales of tobacco are tightly packed. This high pressure causes heat within the bale and the tobacco cooks. The tobacco gets darker and the sugars are drawn out. The tobacco mellows a bit. Many people believe that the darker a cigar is the stronger it is. This is not true. It is actually quite the opposite. A maduro leaf will be a bit mild and sweet compared to the same leaf that has not gone through the maduro process. This brings up the tangent of Oscuro vs. maduro. Maduro has more to do with the fermentation where as Oscuro wrapper leaves are taken from the top priming at medio tiempo (literally half time, meaning theyve been left on the plant 50% longer). Since these leaves have been exposed to a maximum amount of sunlight, they begin to cure on the plant. You end up with a darker, thicker, richer and more flavorful leaf than that of a maduro. Now that you have your test cigars rolled, it is time to get tasting. Every little nuance of the cigar is noted. Qualities that are undesirable are identified. Some tobacco is taken out and some is added. Since there are virtually endless combinations of growing region/seed/priming/age/fermentation, only a complete understanding will get you a cigar that is worth smoking. There could be hundreds of test blends. This concept of factors beyond growing region influencing flavor is what gave us the Perdomo lot 23. The cigar is made from only tobacco that came from one field. There is exactly one growing region in this cigar, and one type of plant. Complexity comes from blending different primings and how the tobacco is aged/fermented. Each individual leaf has its own character. How it tastes is made up of all the elements above (plus some not mentioned in detail). The real key in blending is having very discerning taste and an incredible understanding of how everything affects tobacco. This short essay could (in theory) be the beginning of a life long study of the plant and cigars. Many people study the concept of blending all their lives and only a few of those are going to be considered the great blenders of their time. i still think i coulda done better but i was getting sick of typing it. post 800. I wont make it to 1000 before my vacation in a few days. thats ok though. I need to get my cigars for the contest anyway. Im thinking about a Fuente sampler. ... im not sure though. there are so many good cigars out there. and im not exactly made out of money. whatever it is will be good. i promise. I haven't posted a reply yet because I haven't read the post yet because I haven't had time. I want to be able to sit down and really absorb it. I can tell just by looking at it, though, that there was a ton of work involved. You've done us all a huge service, kuz. Thanks! Thanks for taking the time to do that, Kuzi! As a relatively inexperienced smoker, I can see that is a nice basic reference I'll look go to on more than one occassion. Wow Kuzi, great essay. I think it's incredibly insightful and a great help to us newbies out here. Thanks man. We need a monthly kuzi newsletter. Like the best of kuzi's post this month. This is great man thanks. Now that I've had a chance to sit and really read this post, wow. Bravo, kuzi. Bravo. Do you think we could get the CCOM guys to buy off on this? They could put it in their catalog and/or newsletter. We could call the column "Kuzi's Corner." there have been a few questions on the forum about this. I thought i would bump it up for the newer folks to get a chance to read and ask questions. Yeah, great work Kuzi!! Information overload for me, very nicely done. Thank you kuzi, I was looking for something like this. I guess I shouldn't be surprised to find it on CCom. If this is CLOSE to the edge of your knowledge then, well... buh... umm... hubba... *confused look* I'm stoopid! some people have been asking about sizes of a cigar and how it matters to the taste. I thought i would tack on my essay about wrapper to filler ratio found in this thread. i hope that over time my "blending 101" thread will get better and better and will become a tool that others can learn from. ...i didnt want it to come down to this, but it has to. 1) the part of the cigar that is burning and the part that is just about to be burned is infinitely thin. so at one instant its not burning and immediately after, it is --making it two dimensional. 2) the wrapper has a width of 1/64 of an inch. b) a relatively easy set of numbers to work with. 3.14 x (25/64 x 25/64 ) = 0.4791 (ish) inches squared. now we must subtract out the filler surface area from the entire area to get the surface area of the wrapper alone. therefore smaller ring gauge cigars have a higher wrapper to filler ratio and therefore have a different flavor than the same cigar rolled with the same tobacco and rolled larger. any questions? this is one of the reasons why the lancero size is becoming popular. there are many brands that realize that this change in flavor happens when the size changes. therefore, they change the blend so that every size has the same taste. Many of the classic companies that try to keep with Cuban tradition will not do this. Cuban blenders tend to make different sizes BECAUSE of the different flavors. personally, i like the complexity of the perfecto shape. the wrapper to filler ratio is always changing. Thanks for the drudge work, kuzi. this is why the lancero size is becomming popular. Also because I like them, and I'm a trendsetter. I never knew cigar smoking was so mathematical, I may have to change hobby's... Lancero's remind me of brown cigs, they're a turn off for me. Thanks for putting forth the effort Kuzi. I was thinking of growing tobacco in the Philippines when I retire and have been reading a bit about rolling and so forth. This was great stuff. Just a quick question. What do you know about Pilato? its a strain of cuban tobacco taken from cuba and imported first to the DR in 1962. Its is a smaller (shorter) strain with larger leaves. its, from what i understand, a fairly good filler leaf. Im not so sure on how it does as a wrapper. ill look more into that after i get home from work. ill look more into that after i get home from work. I imagine that this particular plant would produce a fairly complex leaf, given its size. a larger leaf will tend to be more complex in flavor because of the structure of leaves. in the center of the leaf there is a large vein. this is where all the nutrients come up from the roots into the stalk and then into the leaf. from this vein come smaller veins, from them smaller. this is the "skeletal" and "circulatory system" of the leaf. The larger the leaf the farther the nutrients have to ravel to reach the end of the leaf. as they move futher and further along in the leaf they are "used up"
by the time that you reach the fery edges of the leaf there are significantly less nutrients reaching those places... less flavor. if you were to roll these leaves as a wrapper and binder (where most of the flavor comes from) the beginning of the smoke would be a bit more mild than the middle and then it would mellow near the end as well. there would be a bit of a "sweet spot" in the middle of the cigar...hence complexity for the duration of the smoke. in fact, this is how the concept of the NUB came along. When the NUB is rolled, the roller will cut down a larger leaf so that the center area closest to the veins with the most nutrients is used in the wrapper. the nub ends up being very short. this is why they can say it is "all sweet spot"
also why the nub is fairly un-complex throughout the smoke. im not sure. Ive never smoked a "Pilato Puro" I imagine it would have a similar taste to a criollo but a bit milder and with the influences of country it was grown in. from a blenders point of view there are pros and cons to Maduros. Pros: a nice sweet chocolaty taste. indifferent: the strength of the tobacco is diminished a bit. the Maduro process is very hard on tobacco. The tobacco is harvested and baled very tightly. the pressure creates heat and the inner leaves begin to cook a bit. since there is no pressure on the outer leaves of the bale the bales are taken apart and rebound every so often to rotate the tobacco so that all of the leaves are cured the same. all of this is very hard on a fragile natural leaf. many leaves of the bale will develop holes or discoloration that is inconsistent with the rest of the bale or it will darken inconsistently in relation to itself. those leaves cannot be used as wrapper leaf because of those imperfections. they then must be either wasted or used in other ways. Traditionally, Maduro leaves are not used in binder and filler (with a few exceptions: Mx2, Triple Maduro...) but this is the other way that inperfect looking maduro leaves can be used. all in all, Maduro cigars are just another form of cigar... and either you like em or you dont. and dont confuse Maduro with Oscuro!! the first post in this thread talks about that. Very informative & helpful for all us "newbies",,,, thx kuzi ! there have been a few threads in recent weeks that have to to with different vitolas: NUBs, Churchills, A, etc. i will post the meat and potatoes of that thread here as to add to the concept of blending. 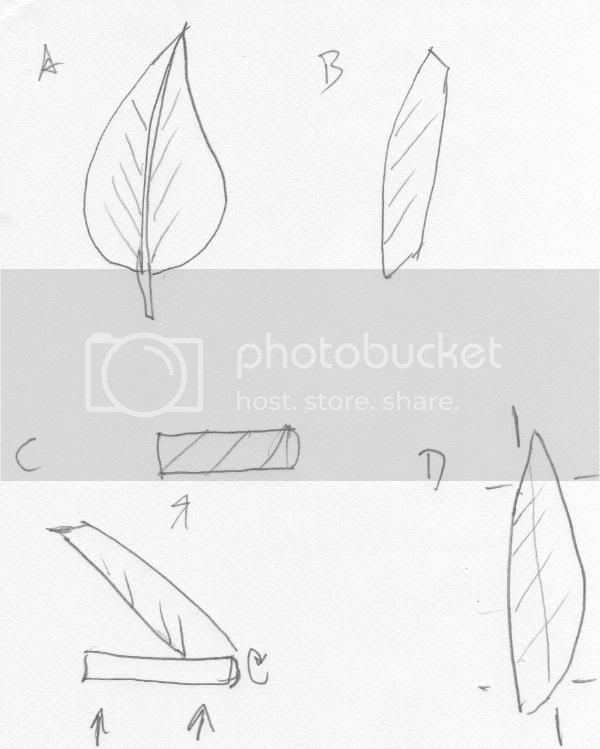 sketch "B" is the wrapper leaf after it has been cut to become a wrapper. the stem has been cut out along with the thickest part of the larger veins and the edges cut down a bit to make a more uniform wrapper. Sketch "C" is the addition of the wrapper leaf to the cigar. the binder is already holding the filler together at this stage. as you can see the leaf is being rolled at an angle. if you have ever looked how the seems in a cigar twist around it like a barber pole this is where it comes from. Sketch "D" shows you how the NUB is cut. (sort of, keep in mind this i a very quick sketch. the actual cut is way more curved and leaves more on one end to make a cap out of) there is more taken off from the edge of the leaf and a bit taken off the tips. these are the areas that do not have as many nutrients reaching them from the stem. this also results in a narrower band of tobacco that can be used as a wrapper so shorter cigars are required. the large ring can remain because the length of the leaf is not that much shorter. another thought with this cigar is that the thick ash form the incredible density of the filler tobacco shields and filters the air more so than "normal" ash, producing a cooler burn. it seems to me that if two cigars are rolled using the exact same blend and ring gauge and then one of them is cut to the length of a Nub (4 inches, I think) and the other is cut to the length of, say, a toro, are you going to tell me that immediately upon lighting each of them, the Nub is already going to be in its 'sweet spot' but the toro isn't?? this is a fundamental misunderstanding of how a cigar is rolled. cigars arent rolled to a ring then cut to a length. every cigar, even a NUB, is designed to be exactly as long as it is. if you were to make a barber pole style cigar you would just use two different wrappers at sketch "B" and offset them a bit so at sketch "C" they would both be visible. Nothing to explain, you have a firm grasp on advertising. I have smoked nubs and they're no different except a bigger ring and shorter length. Nothing special about them. way to be a cynic. LOL - not being a cynic, just that after smoking 5 of them, they're a good cigar but nothing world beating. I just happen to like the toro length. I believe it has the right ring size to length for a cigar. Good tobacco will make any cigar taste great regardless of the length. I'll take a 6x60 from Rocky Patel over a nub any day of the week if I want a big fat cigar. Just my taste and opinion of over 30 years of enjoying cigars daily. you make a point. the sweet spot on cheap tobacco is not as good as the beginning of great tobacco. the toro also used to be my favorite. but i think now im moving into the lancero and the lonesdale and the corona. better wrapperto filler ratio. it gives the wrapper (the best tobacco in the cigar) a platform to shine on. in the vitola commonly known as the "A" (usually in the range of 9 or so inches long) the filler leaf, when bunched, is not folded over or cut. this means that through the length of the cigar you get all points in the leaf. as discussed above, the different areas of the leaf get different nutrients in different ways. the flavor of a singular leaf will not be uniform throughout. the "A" vitola is the most likely to showcase the complexity within the filler. Very informative kuz, thanks again. I do want to add this about the nub. First kuzi is completely correct in that a nub is not cut down to that length, it is rolled that length and like every other cigar(aside from pefectos and shaggy foots) it is just snipped at the end so that the foot is uniform. This is evident when you look at the turns(the seams in the wrapper where it overlaps itself as it is rolled onto the cigar), every cigar(except some lanceros and 'A''s) have three turns. Second the whole concept of a nub is different. To say "they're no different except a bigger ring and shorter length" is 100% incorrect and this is NOT a matter of opinion, it is fact. Most cigars a designed to allow a cigar to develop knowing that the cigar will smoke different at the beginning than it will in the middle or the end. This is complexity, almost all blenders strive for this. The nub strives for the exact opposite they want the cigar to lack that complexity. They want it to be the same cigar in the middle as it was in the begining and will be at the end. all of that is true. nice addendum. Great info and great add ons. I've read this a few times now and love it. Bumping this up for some of the newer guys around here to read. Awesome info here - thanks Kuzi. Nice piece! There are some great videos out on the web of some of the masters like AJ Fernandez going through the process of examining tobacco for it's qualities and blending tobaccos for taste. They are quite interesting to watch and informative. You get a sense of how well he "knows" tobacco as he looks at it and handles it. Also he always has a stick with him, I like that.